Users of the newest pre-paid mobile service on Bulgarian market FROG Mobile now call other FRОG users at the promotional price of just BGN 0.09 per minute instead of BGN 0.14. The promotional price is valid until June 30, 2008, the company said on a press release. 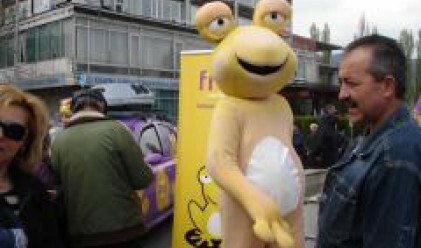 Meanwhile, FROG Mobile launched its Grand Tour which is to visit 26 cities across the country and will give away thousands of prizes. The tour already visited Assenovgrad, Smolyan and Plovdiv where tens of users successfully folded the FROG Mobile origami puzzles and won start pack or recharge vouchers. The tour will also visit Haskovo, Kurdjali, Stara Zagora, Yambol, Sliven, Burgas, Varna, Shumen, Targovishte, Razgrad, Ruse, Silistra, Svishtov, Veliko Turnovo, Pleven, Vratza, Kyustendil, Pernik, Pazardjik, Blagoevgrad, Petrich and will close in Sofia on May 7. FROG Mobile, which employs mobile operator Cosmo Bulgaria Mobile EAD network, is addressed to all that are interested in basic mobile services and want fast and easy pre-paid connection without monthly subscription. All FROG users now enjoy the price of just BGN 0.9 per minute for calls to all other FROG users and a single flat rate of BGN 0.34 per minute for calls to all national mobile and fixed networks and to the fixed networks in Greece, Turkey, Romania, FYROM, Albania and Serbia. The charging of SMS is BGN 0.14 per message. FROG Mobile start packs are available in newspaper kiosks, gas stations and supermarkets across the country at the price of only BGN 7.78. The activation of FROG is fast, simple and easy – users just have to make a call to any number (except emergency numbers). Users have BGN 5 of airtime credit upon activation and may easily recharge with vouchers of BGN 4 and BGN 8, also sold via the kiosks, gas stations and supermarket across Bulgaria.